We all are aware of the fact that nothing is permanent in this world, neither products nor technology. As day by day, improvements and updations are made in technology, leading to new inventions and innovations in every sphere of life. Invention refers to the creation of a brand new product or device. Conversely, innovation is an act of making changes to the existing product or the process by introducing new ways or ideas. At first sight, the two terms sound alike, but if you dig deeper, you will find that there is a fine line of difference between invention and innovation that lies in their connotations. While invention is all about creating or designing something, innovation is the process of turning a creative idea into reality. Meaning Invention refers to the occurrence of an idea for a product or process that has never been made before. Innovation implies the implementation of idea for product or process for the very first time. What is it? Creation of a new product. Adding value to something already existing. Concept An original idea and its working in theory. Practical implementation of new idea. Skills required Scientific skills Set of marketing, technical and strategic skills. Occurs when New idea strikes a scientist. A need is felt for a product or improvement in existing product. Concerned with Single product or process. Combination of various products and process. Activities Limited to R & D department. Spread across the organization. The term ‘invention’, is defined as the act of creating, designing or discovering a device, method, process, that has not existed before. In finer terms, it is a novel scientific idea conceived through research and experimentation that turns into a tangible object. It can be a new process of producing a product or may be an improvement upon a product or a new product. Inventions can be patented, as it provides security to the inventor, for intellectual property rights, and also identifies it as an actual invention. Further, different countries have different rules for obtaining the patent and the process is also costly. To be patented, the invention must be novel, have value and non-obvious. The word ‘innovation’ itself signifies its meaning, as the transformation of an idea into reality. In the purest sense, innovation can be described as a change that adds value to the products or services; that fulfills the needs of the customers. It is when something new and effective is introduced to the market, that fulfills the needs of the customers by delivering better products and services. 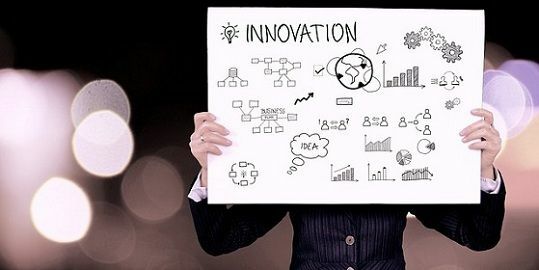 Innovation can be an introduction or development of new product, process, technology, service or improving/redesigning the existing ones that provide solutions to the current market requirements. All the process that help in the generation of the new idea and translating it into the products demanded by the customers are covered under innovation. The occurrence of an idea for a product or process that has never been made before is called the invention. The implementation of the idea for product or process for the very first time is called innovation. The invention is related to the creation of new product. On the other hand, innovation means adding value or making a change in the existing product. The invention is coming up with a fresh idea and how it works in theory. As opposed to innovation, is all about practical implementation of the new idea. The invention requires scientific skills. Unlike innovation, which requires a broad set of marketing, technical and strategic skills. The invention occurs when a new idea strikes a scientist. Conversely, innovation arises when a need realized for a new product or improvisation in the existing product. The invention is concerned with a single product or process. As against this, innovation focuses on the combination of various products and services. While the invention is limited to research and development department of the organization. Innovation is spread all over the organization. So, it can be said that innovation is not the same thing as invention, as these are two different concepts. Both the activities requires huge capital investment in the research process. Further, the invention is when something new or novel to the world is discovered, while innovation is about introducing an effective way of using, producing or distributing something. One important difference between invention and innovation is, an idea when proved workable, it is called as the invention. On the other hand, an innovation is when the idea not only be proved workable but also requires to be economically feasible and fulfill a specific need. Hi Surbhi, I like your articles as I consider your articles as understandable.